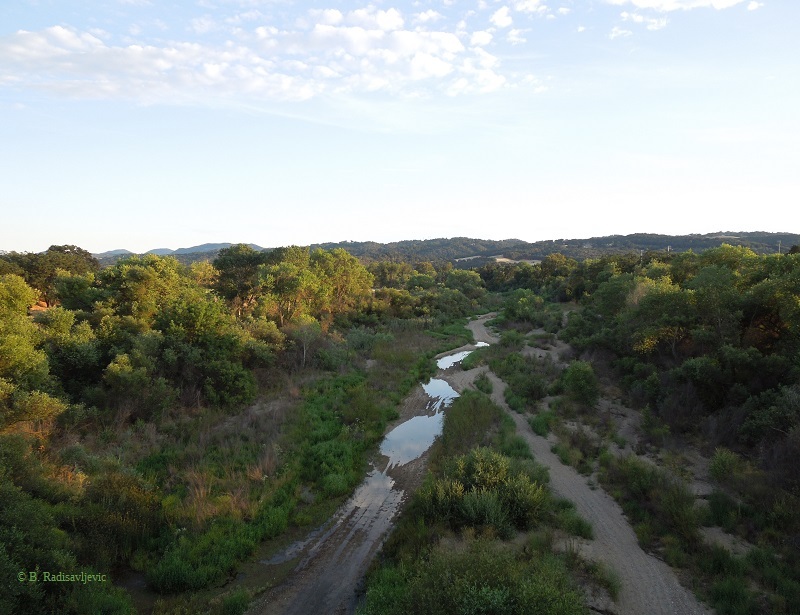 Yesterday I made a stop in Templeton to see how much water had been added to the Salinas River since I photographed it there in July. This is the picture I took from the Vineyard Drive Bridge looking south on July 2. As you see it looks like a series of large puddles. 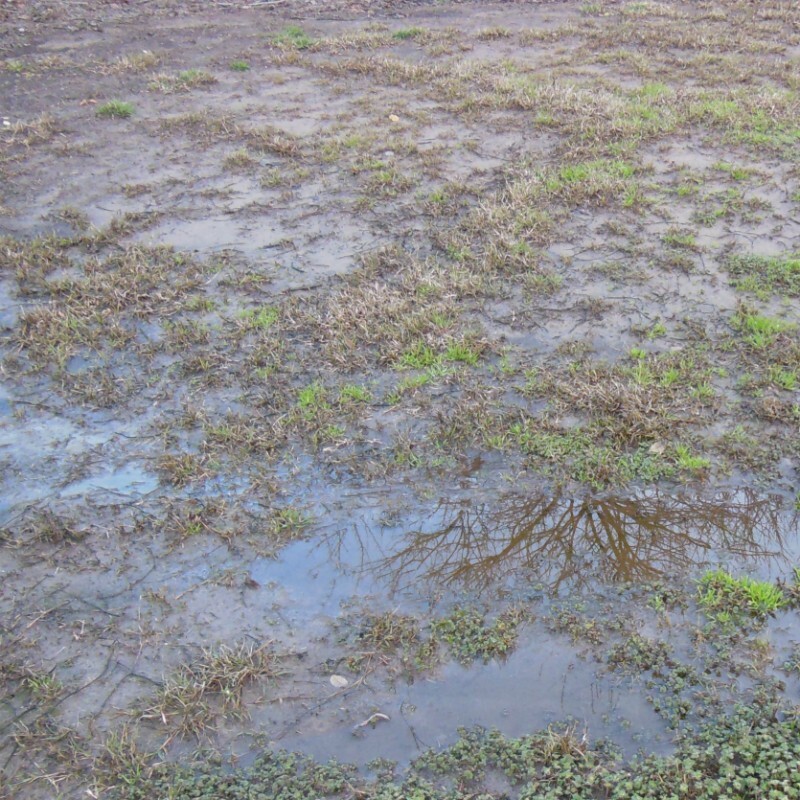 The shrubs and grasses still get water from beneath the surface to stay green. Here is the most comparable photo I took yesterday looking south. 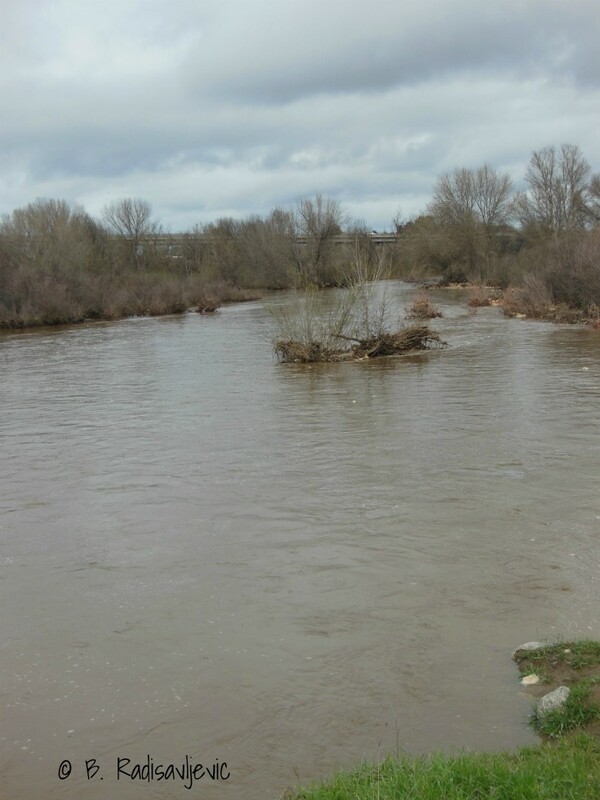 You can see that the river was recently much wider. 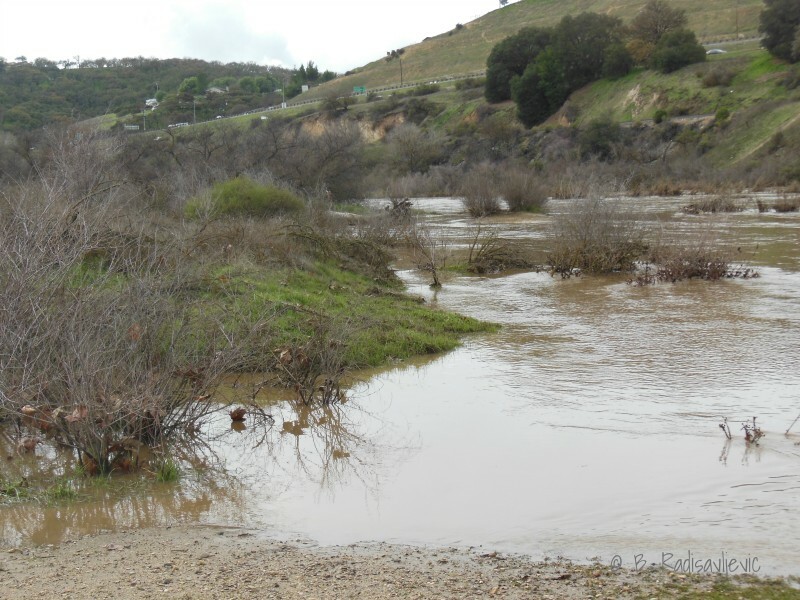 By the way the shrubs bend you can see the north-flowing river had gone over them. Most of the shrubs that were green in July have turned brown, especially on the sandbar in the middle. I took these photos in late afternoon, and I didn't notice the sun spots until I uploaded the pictures. 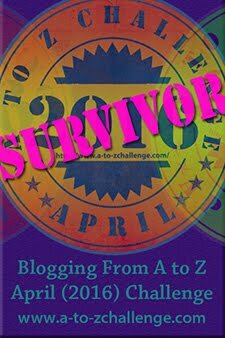 I just made a puzzle of this shot at Zazzle. Here it is. I edited the sunspots out of the puzzle. It is not watermarked, either. This next photo is a closer look at the part of the scene just beyond the sandbar. Next is a closer look at the west bank. 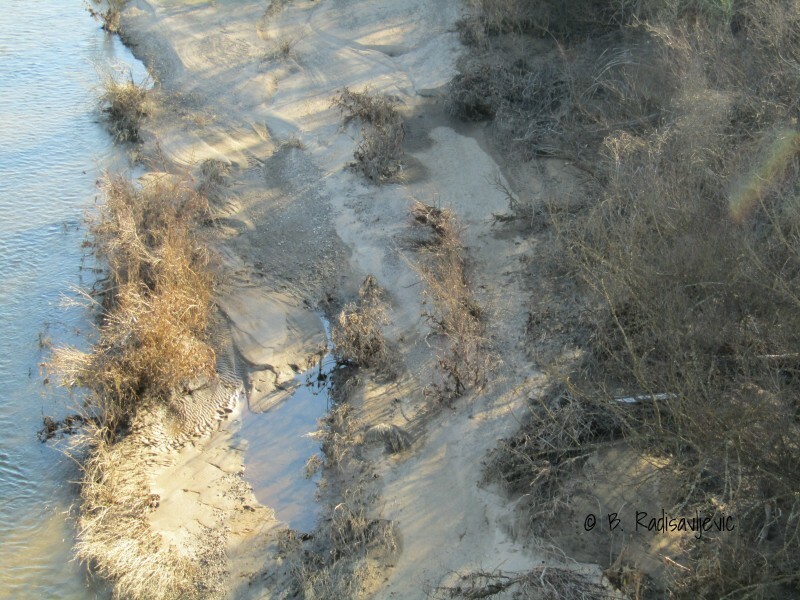 You can see the patterns formed in the sand by the flowing river. You can also see how much more of the river was recently covering this. I also took photos from the north side of the bridge. 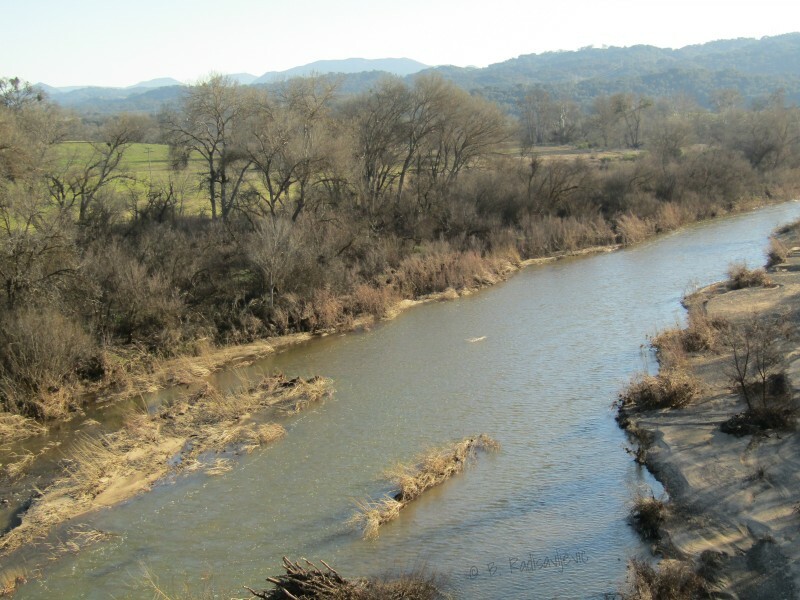 The Salinas River flows north, not south like most other rivers. It finally empties into the Monterey Bay. This photo focuses on what I see immediately in front of me as I aimed the lens north. 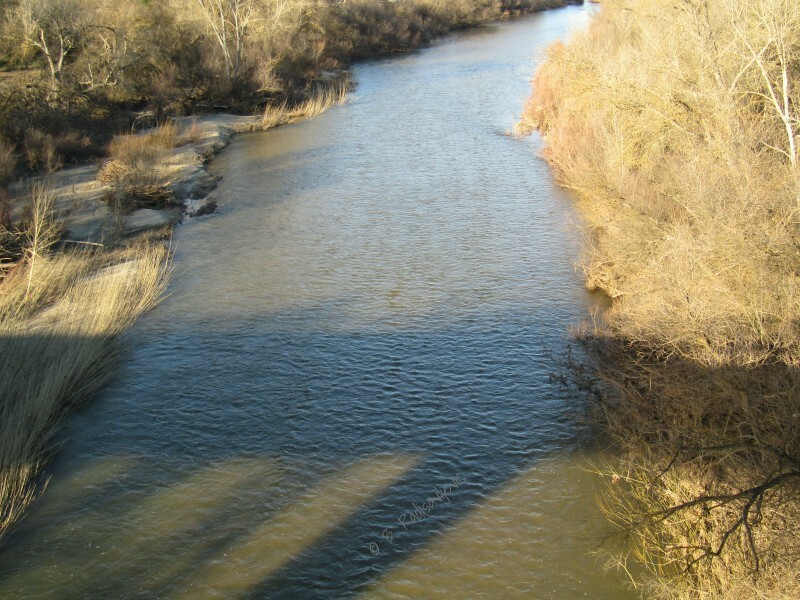 You can see the shadow of the bridge falling across the river. Here is a more detailed view of the west bank. There is still a bit of shadow from the bridge. 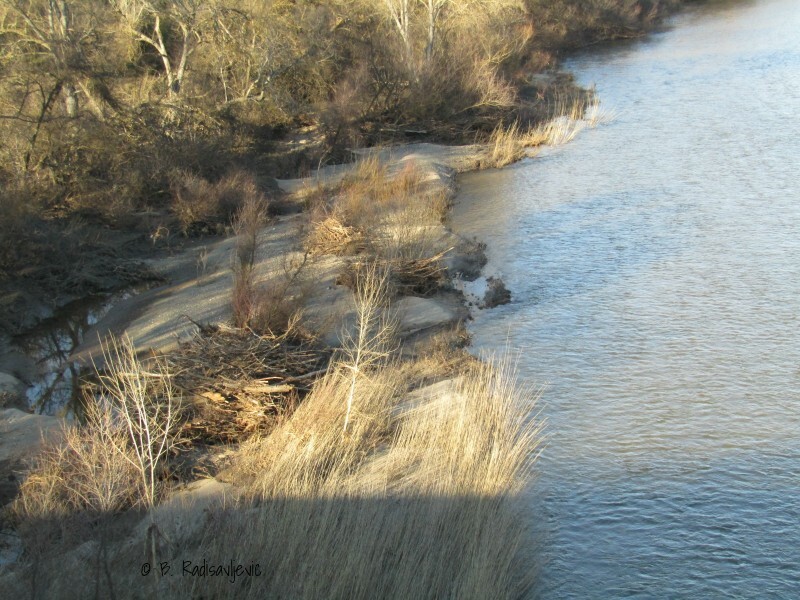 Notice that some of the water is caught right next to the bank. Here, too, you can see how the grasses in the river are leaning north where the river flowed over them. 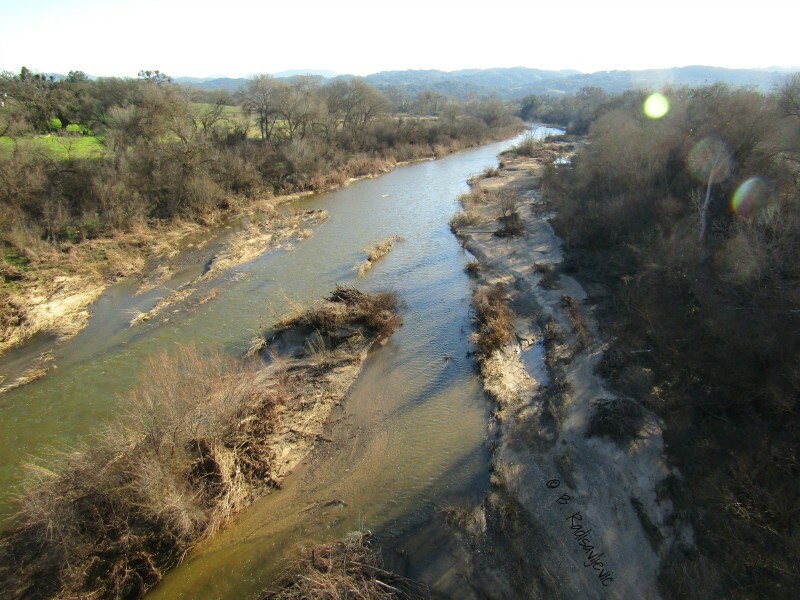 I'm wondering how long this river will remain visible if we don't get more rain soon. 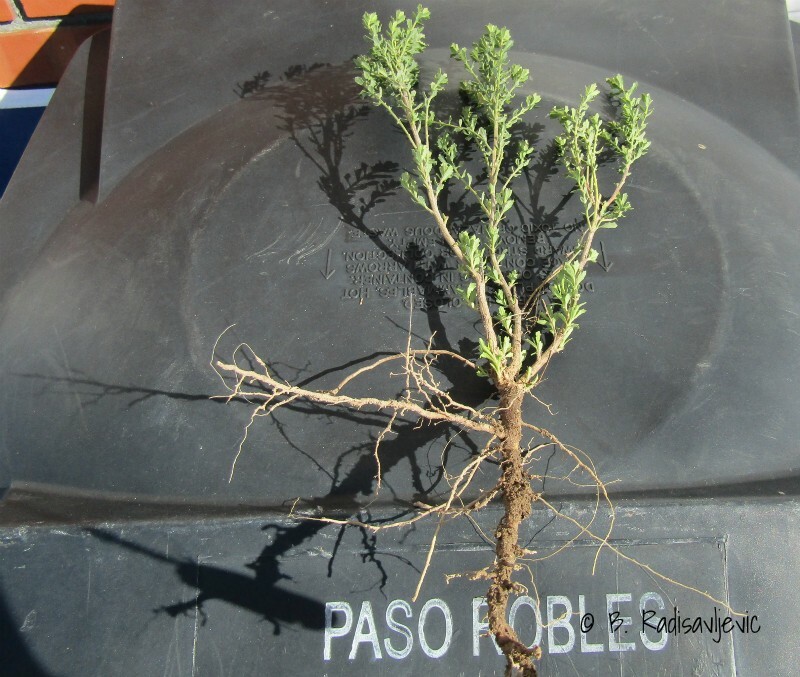 I photographed this small coyote brush weed after pulling it to document its root size. Then I noticed the shadow of the plant. 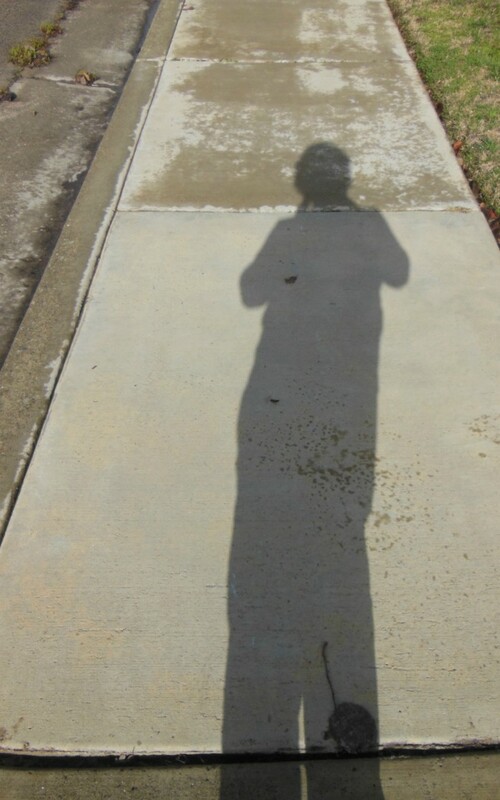 My shadow was so long I had to document it. The rain was gone. The sun was out. I and my camera were ready to take a photo walk. I actually didn't see the bird while I was taking the picture. 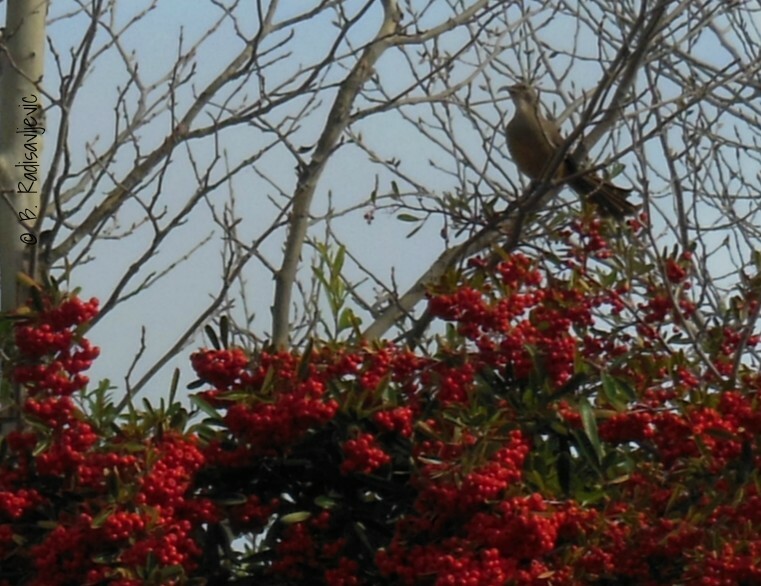 I was focused on the red berries on the fence beside the J. C. Penny parking lot. On the other side is the trail inside Larry Moore Park. 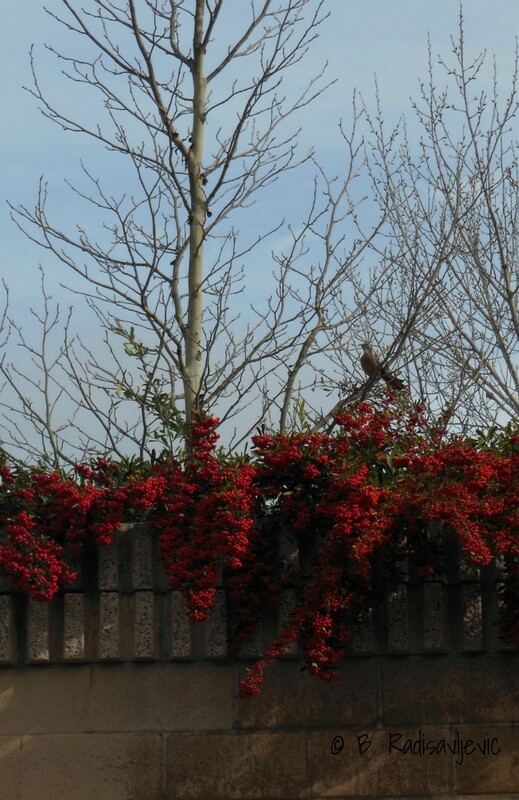 I found the bird when I uploaded my photos. Below you see the bigger picture. Have you ever discovered something special in a photo you didn't know was there until you uploaded it to your computer? Does Anyone Live in this Tree? The sun has been a rare sight during these days of rain. It was gloomy most of the day but in the late afternoon I looked in the back yard and saw this bit of sunshine among the shadows. 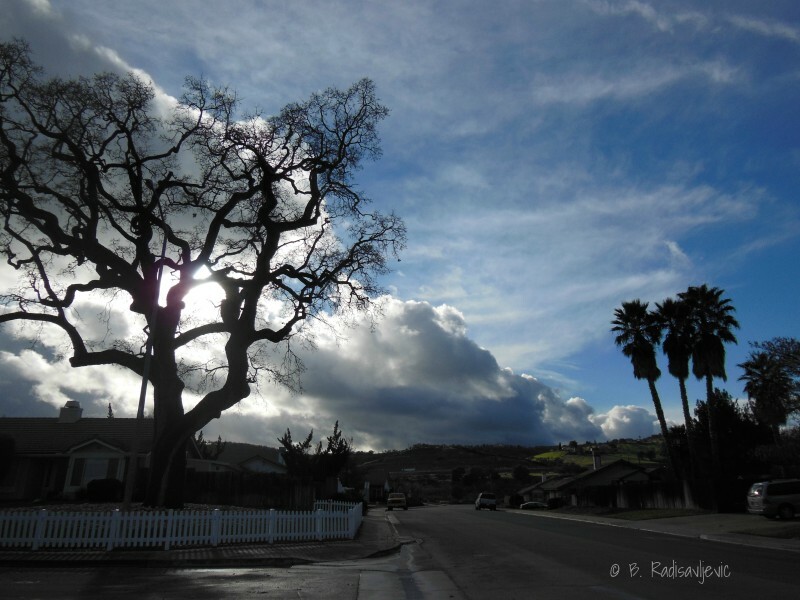 In the front yard, I could see the sun hidden in the clouds behind my neighbor's oak tree. 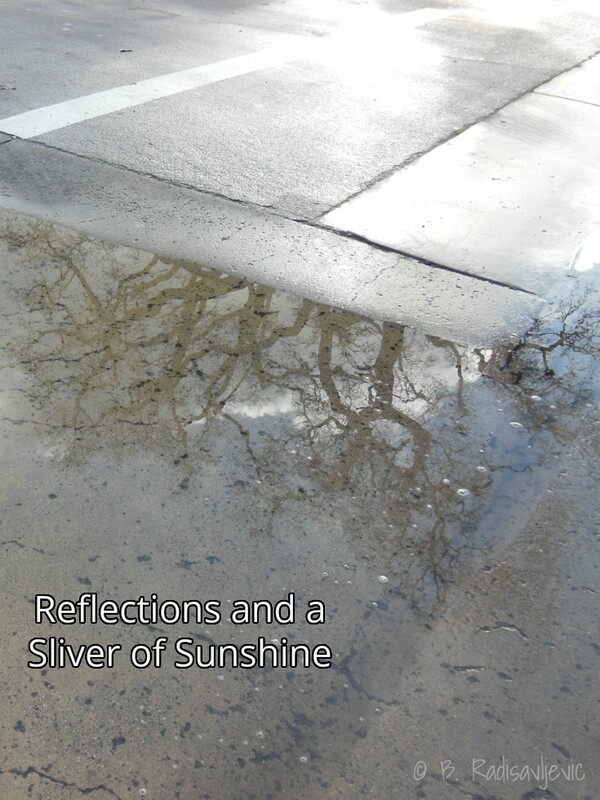 On my side of the street, the tree was reflected in a small puddle next to the curb. 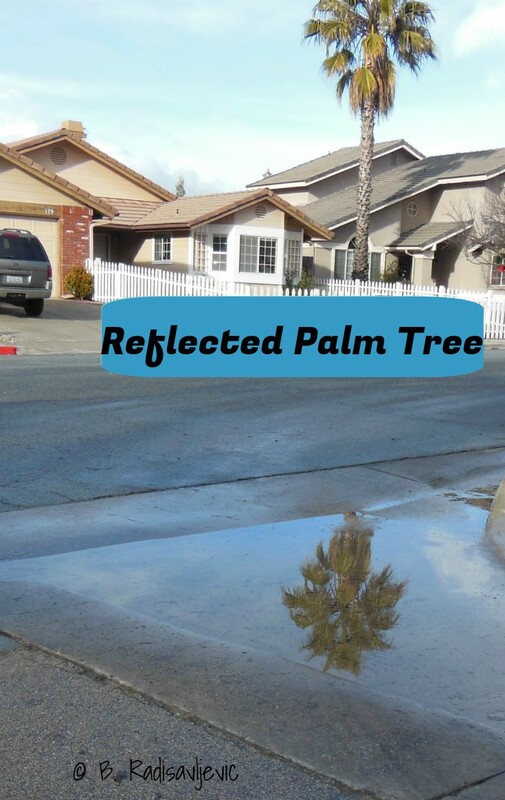 The palm tree across the street in the other direction was reflected in the same puddle when I faced it in the other direction. 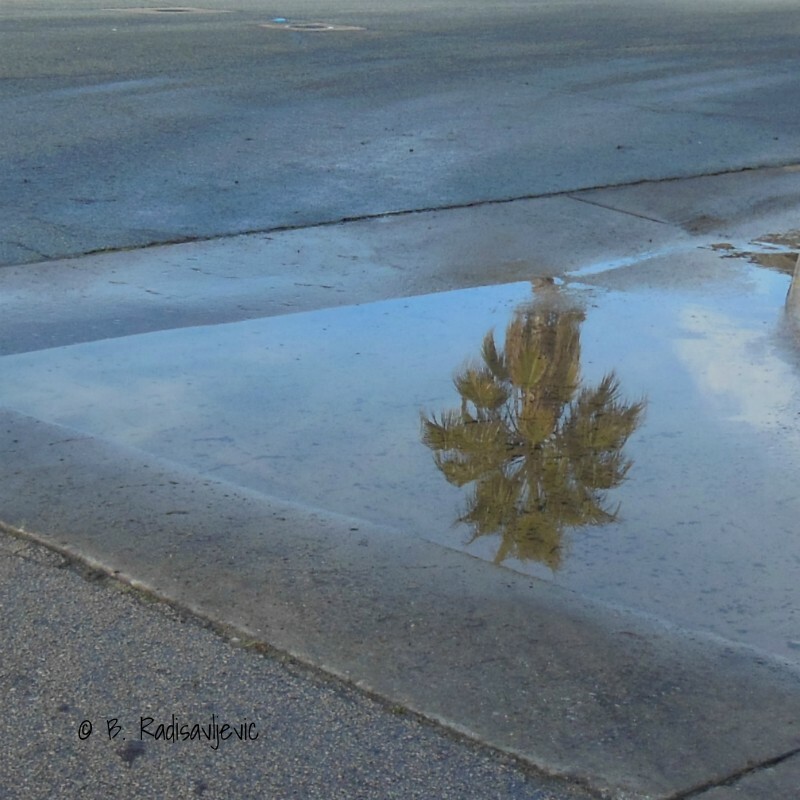 Here's a closer look at the palm reflection in the puddle. 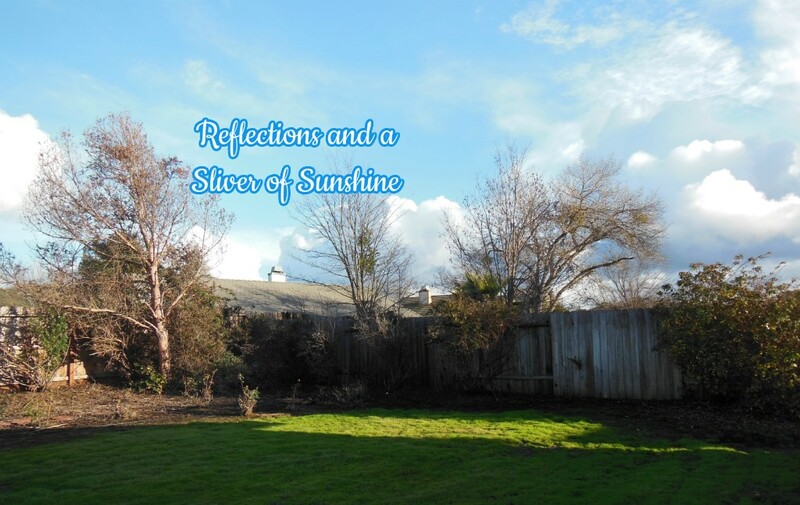 In the back yard, a very shallow puddle in the former lawn reflected part of the blue sky and a tall tree at the back of the yard. Just How Big Is That Oak? 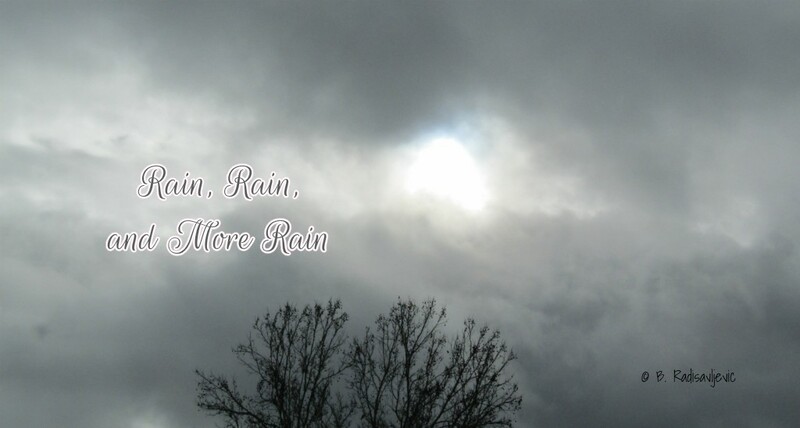 It seems it's been raining for days now. When it's not raining, it's getting ready to rain. The cloud formations are beautiful. Below, the sun is just peeking through a cloud. 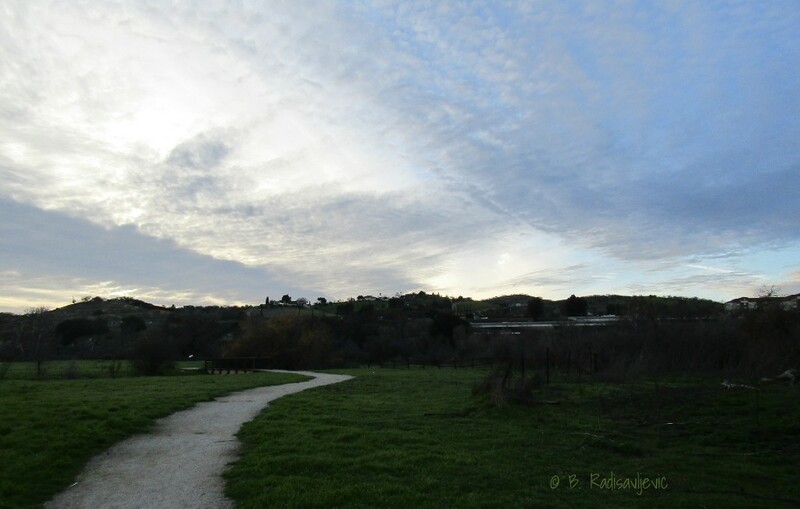 Below is a path to the river through Larry Moore Park between storms. I shot this from my back porch during the rain today. 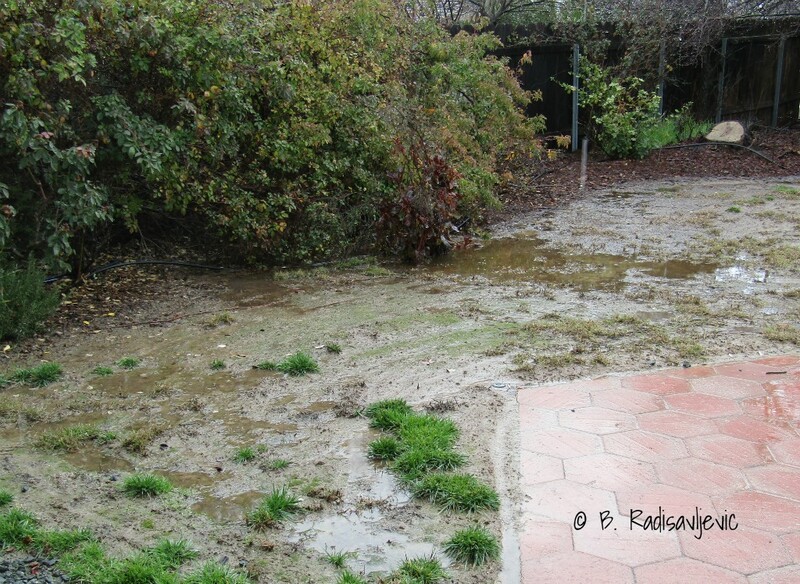 This used to be my dead lawn when I stopped watering it during the drought. I've never seen such puddles there before this year. I taped this video at the same time I took the photo above. I turned the sound way down because a very noisy vehicle went by while I was shooting this. After I shot the video, we ate lunch. Then the sun came back out again for a few minutes before the sky went gray again. It has been raining off and off since then. More rain is expected during the next two days. 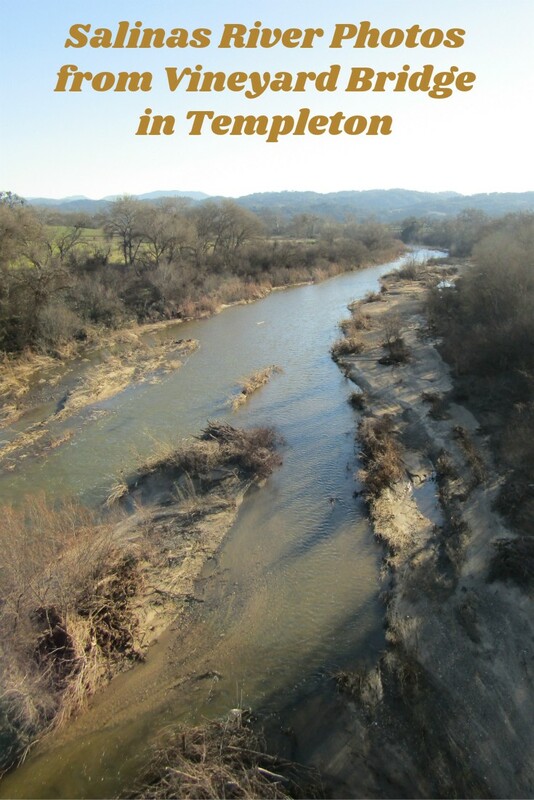 I haven't been out to take my own photos of the local lakes yet, but this video shows how the level of Atascadero Lake has come up since I took pictures during the drought. You can see those photos in the related posts below for comparison. I was happy to see the island surrounded by water again. 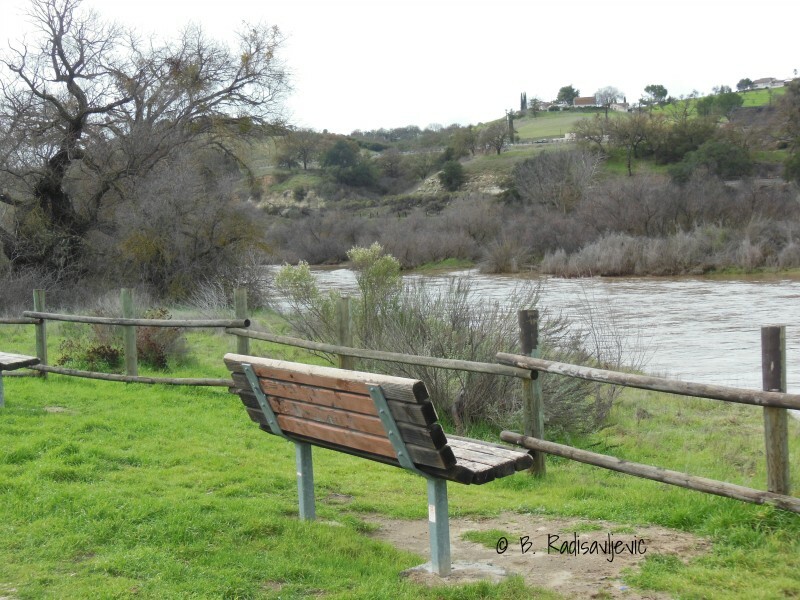 I have been out to see the Salinas River flowing and I took lots of photos. Here are a few. Although I miss the sun, we will see it soon again. Meanwhile, I'm thankful for the rain that is filling our lakes and the river again and watering our oaks, street trees, and landscaping. We won't need to water again for weeks.